The Bulls Sunday night won their second consecutive game, 104-97 over the Minnesota Timberwolves, after having lost 14 of their previous 24. The Miami Heat Sunday won their 26th consecutive game. The Bulls have Jimmy Butler, who started for the injured Marco Belinelli at shooting guard, and had 20 points, nine rebounds and three steals. The Heat has Dwyane Wade, slightly better known coming out of Marquette. The Bulls have Nate Robinson, their leading scorer Sunday with his first 20/10 game of the season with 22 points and 10 assists. The Heat’s top scorer, of course, is LeBron James, who is in the top five in the league in scoring, in the top 10 in assists and double/doubles, the top 15 in steals and in the top 25 in rebounding and almost certainly will be voted the league Most Valuable Player. That’s Wednesday when the Heat figure to come into the United Center just six wins short of equaling the alltime NBA consecutive win streak of 33 after a likely Heat win in Orlando Monday. Miami now has the league’s best record and has a better road record than the Bulls have home record. But for the Bulls, it’s encouraging small steps again as they moved to 38-31 with another solid victory even as Nazr Mohammed started at center again for the ailing Joakim Noah, Butler was the third string shooting guard with Richard Hamilton and now Belinelli out, and the Bulls stitched together another win with their typical assortment of mismatched pieces, discarded elements (three of their top eight Sunday were released after last season) and often unwanted figures. I’ve had consensus of fans over the last few years routinely email me to suggest every one of the eight players the Bulls used Sunday should be traded and dumped for even draft picks. Maybe coach Tom Thibodeau just uses hypnotic suggestion and then when he begins screaming plays, defensive formations or the words “Madagascar,” “Constantinople,” or “No Nate,” the guys who are in there seem to forget they are tired or hurt. “I thought the rebounding was the key to the game,” said Thibodeau of the Bulls dominant 52-32 edge and overwhelming 20-6 on the offensive boards. “We had a lot of people step up and play well. I thought Nazr protected the rim great for us. To start the game the ball movement was good. We just found a way to win. We were in mud to start the game. I thought we had some good looks that we didn’t make and we got a second and third shot at it (11 first quarter offensive boards: Run for cover Chris Bosh). I thought that gave us life. Once we got going a bit I thought that was the whole key to the game. The Bulls did in Thibodeau’s typical taking attendance after a win rundown. Gibson banged knees late with Ricky Rubio, but returned and has taken up the Noah role of defensive leader showing how much his absence hurt. The bench is once again contributing on a high level (36-31 edge), and that’s mostly due to Gibson’s physical effort even with Robinson’s hot shooting game. 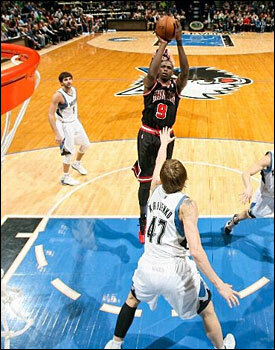 But I thought the game was won, or at least saved, by Deng, and Thibodeau seemed to agree. Actually, it was a few plays in a game the Bulls pretty much dominated throughout, leading by 15 after a 32-10 first half run and then moving the lead up to 16 in the third quarter and still 13 with nine minutes to go. And about a minute later Deng replaced Cook after a pair of Minnesota threes cut the Bulls lead to 85-78 with just over eight minutes left. Robinson missed from in close. But Deng rescued the ball heading out of bounds and shoveled it impressively to Boozer for a score. Williams added a third three and with a fifth straight Minnesota scoring possession as the Timberwolves were killing the Bulls with pick and rolls, Dante Cunningham popped out for a 20 footer to cut the Bulls lead to 90-85. Butler then missed a 20 footer, and the Bulls were just about to get to that announcer favorite one possession game when Deng again interfered, snatched the miss even after boxed out over the top of Chase Budinger and in one motion got it to Robinson lounging outside for a three pointer. Those are winning plays, the plays that blunt momentum and drain energy, the plays a star makes. 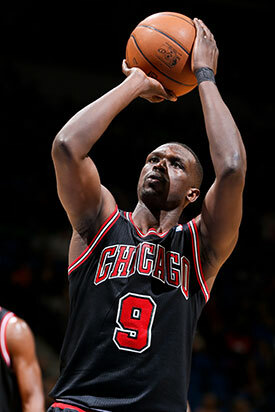 Deng made the most crucial plays without scoring a field goal in the fourth quarter. It was the way you’d see a Jason Kidd or Magic Johnson win a game and then check the box score and not find them until four or five down in the scoring column. Robinson made four of eight long balls as the Bulls were firing them like they were Minnesota snowflakes, 10 of 26 threes for the game. But nothing takes a team’s breath and vigor away like losing an offensive rebound and defensive possession like that when you have fought all the way back. Aw geez, the heck do you mean. Cunningham then missed an 18 footer as the Bulls had their defensive boards covered solidly, and Robinson, who had been bumping and feuding with fellow munchkin J.J. Barea much of the last few minutes, held it together and found Butler running ahead. 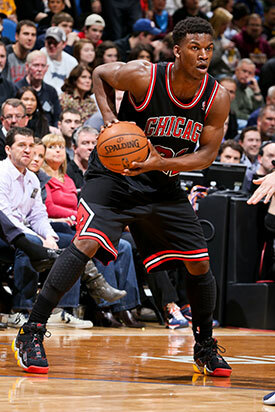 He was fouled and made two free throws for a 95-85 Bulls lead with 5:30 left. 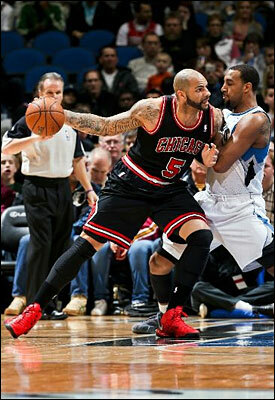 Thibodeau went small again in his recent mad scientist role, bringing in Hinrich for Boozer to play along with Robinson. Though Boozer was putting in another good offensive effort, the Timberwolves were taking advantage of him in the pick and roll. So Thibodeau went back to Gibson at center and Deng at power forward, which makes them so valuable if often overlooked. There aren’t many forwards in the league who can both switch out and play perimeter players as both Deng and Gibson do — and the Bulls are tough to score against down the stretch because they can switch so many big players including Noah onto smaller players — and then handle themselves against physical interior players. And that was another assist from Deng as Hinrich came in to replace Boozer. Barea was still going at Robinson and now Hinrich. Hinrich had heard enough and he started after Barea after Barea knocked the ball away at a stoppage in play, Hinrich only to be restrained by Deng as Barea drew a technical foul. Though it wasn’t only Barea’s diminutive size as Hinrich pretty much doesn’t know he weighs 185 pounds. The Bulls also have been showing some edge of late, like Robinson’s takeout of Lance Stephenson against the Pacers, which Robinson insisted Sunday was accidental, Belinelli, who had to give in to an abdominal strain that’s been bothering him a week or so, getting into it with the Pacers as well and Hinrich his usual feisty self Sunday. The Bulls tend to be physical, if not cheap about it and sometimes are condemned for being too passive. You don’t want to get into the sort of petty stuff you’ll see with the Pacers, Knicks and Kevin Garnett. But a good retaliation gets an opponent’s attention sometimes. Robinson doesn’t get into that much, I suspect, sort of like a boxer. He’s a football player at heart and probably doesn’t even notice sometimes when he’s hit. He certainly doesn’t notice the talk given he never much stops himself. Butler converted the technical for a 96-85 lead and the crisis was pretty much passed, even if Tracy McGrady once scored 13 points in the last 35 seconds. Rubio, who is a delight to watch with his amazing sleight of hand passing that does remind you of Pete Maravich, got Williams for a dunk. And Robinson gave the ball up twice for no apparent reason and with seemingly little intention of doing much. But the Timberwolves could manage just one in four free throws while Deng—yes, again—was making the play, a classy straight line pass as Gibson sealed Andrei Kirilenko and dunked the ball and was fouled. The subsequent free throw gave the Bulls a 99-88 lead with four minutes left and enough defense that you knew the Timberwolves weren’t getting to 100 points. Robinson added another three on nice ball movement from Hinrich to Boozer to Robinson to effectively close it out on Robinson’s most versatile offensive night of the season. He is a riddle, certainly, wrapped in mystery inside an enigma. That was Churchill talking about either Russia or Nate, who really could be a heck of a defensive player as well, as he does at times like in the Pacers’ game. With that football mentality and even with his size disadvantage, if Robinson wanted to get up and play physically he could as he got into it with Barea as well. You pretty much can’t hurt Robinson, who has taken as many falls as all the players combined this season. And still comes up talking. He can be an uncanny shooter, as he was Sunday when the Bulls blew open the game in the second quarter with a Nate-o-rama quarter with 11 points and six assists, basically having a hand in 23 of the 33 points as the Bulls took a 56-43 halftime lead. And that only when Williams banked in a three to end the half. There was a great stretch midway through the second when Robinson curled into the lane for a jumper, banked in a jumper and followed with a three. The 24-44 Timberwolves are pretty much done for the season and came out like it. Not only did the Bulls hammer them on the backboards, there was one late first quarter possession when the Bulls got five offensive rebounds and a steal the only time the Timberwolves got the ball, ending in a Gibson slam dunk and 23-16 lead after Minnesota opened ahead 12-5. A word also about Mohammed, who’d been forgotten and seemingly as useful as two-day old stuffed pizza. But Ponce de Mohammed kept the rugged Nikola Pekovic in check (if not mate) in playing his second most minutes of the season after his most Saturday. The Timberwolves, like the Bulls, have been wrecked by injuries with Love still lost. But they have given in to them more than the Bulls, and their defensive effort on shooters in the first half was so indifferent that Adelman eventually had to go to a zone defense with little impact. The Bulls moved the ball with 25 assists, negating the zone and then powering up as well as Gibson continued to play strong despite his sore knee. Butler made a pair of threes in the latest shooting guard audition, though Butler doesn’t quite know yet how to take advantage in the post. The Bulls kept going to him with Ridnour trying to defend him. Butler had a huge size advantage, and is quick and strong enough to play shooting guard, and is showing a better shot. He rushed too much against Ridnour early, and it wasn’t until late in the third that he got deep enough position that Minnesota wasn’t able to send help and he ran Ridnour out of the game. And even if he sometimes a reluctant shooter, Butler was terrific again in a starting role and going 44 minutes of pure movement and hustle seemingly without sweating. He has proven to be a big fourth quarter performer as he had a three when the Timberwolves opened the fourth with a score. Butler then sent Minnesota into an early timeout after an open court steal and fast break slam dunk for that 85-72 lead with 9:05 left. Plus, Butler got to the free throw line a team best nine times with size, speed and a fearless ability that isn’t common in the regular backcourt. Also, Hinrich, though his shot remained awry since his latest return from injury, continued to free up the Bulls offense the way he runs the pick and roll so much better with the proper angles for space and passing advantages. I was a little surprised Marquis Teague didn’t get in the game after a strong stint against the Pacers Saturday running the team. But Robinson was running hot and probably justified staying in when the Bulls were small late with he and Hinrich in the backcourt. The Bulls kept that double digit edge much of the third quarter, and then they made the plays when it mattered. Twenty-something? How about back to back and against the Timberwolves!